It felt like I hadn’t made soup in ages! 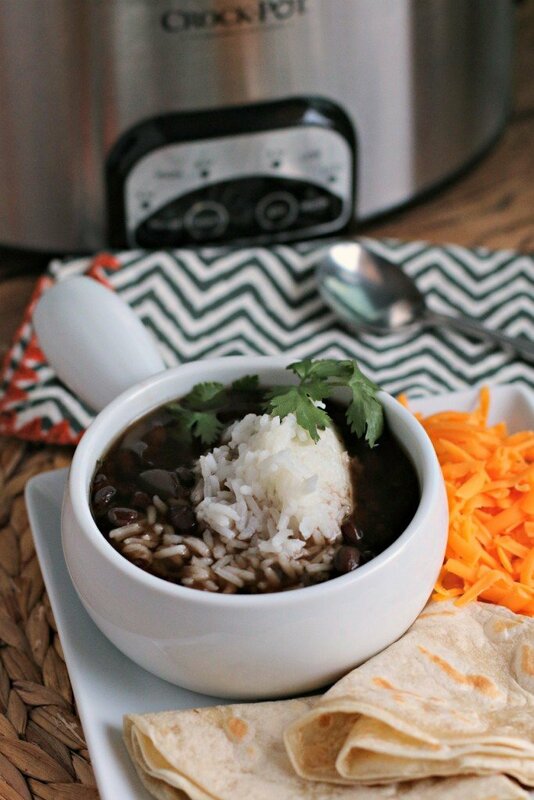 I made this amazing slow cooker black bean soup yesterday. It was so good! I’ve been testing this recipe for a while now, trying to get the liquid and flavoring just right. When I got off work yesterday and opened the lid to my slow cooker and tasted it, I finally nailed it! This is one of those perfect work day recipes, since it cooks for 10 hours! I flavored this soup with a ham hock, jalapeño and cilantro. My inspiration for this came from a co-worker who had brought in a black bean soup to work. She is the best cook I know, her soup had so many layers of flavors, so it took me a while to make something that stood up next to hers. My co-worker calls her soup “ghetto soup” for she puts a little of everything in it, even chopped up hot dogs. I left the hot dogs out of mine, but in hindsight they would have been really good in this. I hope you all are having a great week! My book is officially released, I know some of you have already ordered. I hope you are enjoying the book. If you would like to order, you can get a copy here. The book is gorgeous in person! Serving items- just cheddar cheese is good, but also great with steamed rice, Tortilla Land Tortillas, chips and sour cream! Soak beans overnight- I do this by putting the beans into the slow cooker, sorting out any rocks and dirt clumps if I see them. Cover with a few inches of water and place the lid on top. DO NOT TURN ON YET. Leave the beans to soak overnight. In the morning after the beans have soaked, drain the water off the beans. Add the chicken broth, diced tomatoes, ham hock, onion, jalapeno, garlic, chili powder, onion powder and pepper. I wait to add the cilantro, I add it right before serving. Cover and cook on LOW for 10 hours, without opening the lid during the cooking time. Remove the ham hock onto a plate, remove any meat you can find off the ham hock, shred and put into the beans, add cilantro, and stir. This is the time you will taste and decide how much salt to add. That soup does look yummy — with a nice hot loaf of bread for dipping! I bet this was amazing! it sounds fabulous! I cannot wait to see your cookbook! I love the flavors in your soup and that it is a 10 hour slow cook ! Sounds delicious. This soup would be perfect right now in this chilly weather! Can’t wait to get my hands on your book! 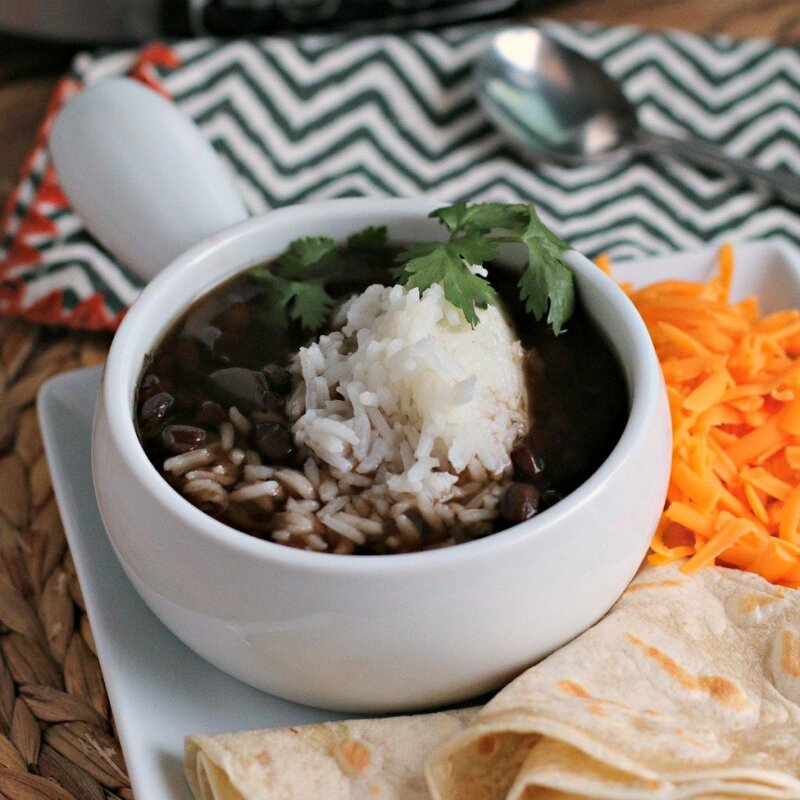 I need to make this soon, love black beans and rice! This looks like my kind of soup! Love the scoop of rice added in!